Something not to be missed by ALL pets owners out there! Have you got your own furry fashionista at home? Between the 29th July – 30th August, Buyagift.com is on the hunt for furry fashionistas. Your pet could be the next Cindy Clawford or an up and coming Miranda Purr, or perhaps you’ve got the next Bunny Hicks at home – all you need to do is send in their photo to find out – the competition is open to ALL pets! While they are ultimately on the lookout for the most camera-friendly companions, they would also like you to be creative with your entries. The funnier, the more original and more inventive the snaps – the more likely they are to make the grand-final and eventually become: Buyagift’s Next Pet Model. 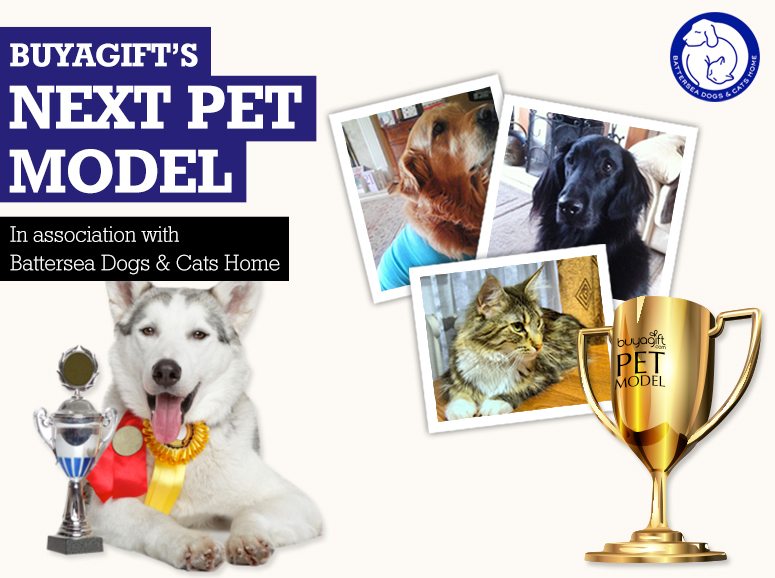 • Upload your pet snap to their Facebook page (or email it directly to petmodel@buyagift.com). • They will pick the four best pictures to go through to the grand-final to be judged by the guys at Battersea, and they also send a fifth finalist through – this will be the picture with the most Facebook votes. • The winner and runner will be announced in mid-September. • The chosen pet will become Buyagift’s Next Pet Model because they’ll use a selection of the best snaps from the photoshoot, to use on their fantastic new pet product page. A professional pet photoshoot in London (or they will send a photographer to you if required). A pet pamper day at a top London spa. A selection of pet accessories from the site. PLUS Buyagift will donate £1,500 to Battersea Dogs & Cats Home on your behalf – You’ll be able to present the cheque to Battersea and receive a full tour of the shelter! There are two ways you can enter this exciting pet competition. For full Terms and Conditions please visit Buyagift Next Pet Model page. As you can enter up to 2 pictures per person; I have entered Bunk and Lilly and 2 shots of Mr.Ginger, I think he would enjoy a model role the most from all our pets, from Mark’s account. Good Luck and let the most gorgeous, huggable, lovable darling of a pet win! < Previous What’s happening when a man gets bored? might just have to enter this!! !